Lawrence Technological University and Bahcesehir University in Istanbul, Turkey, have signed a memorandum of understanding that clears the way for student and faculty exchanges and the development of joint degree and certificate programs. 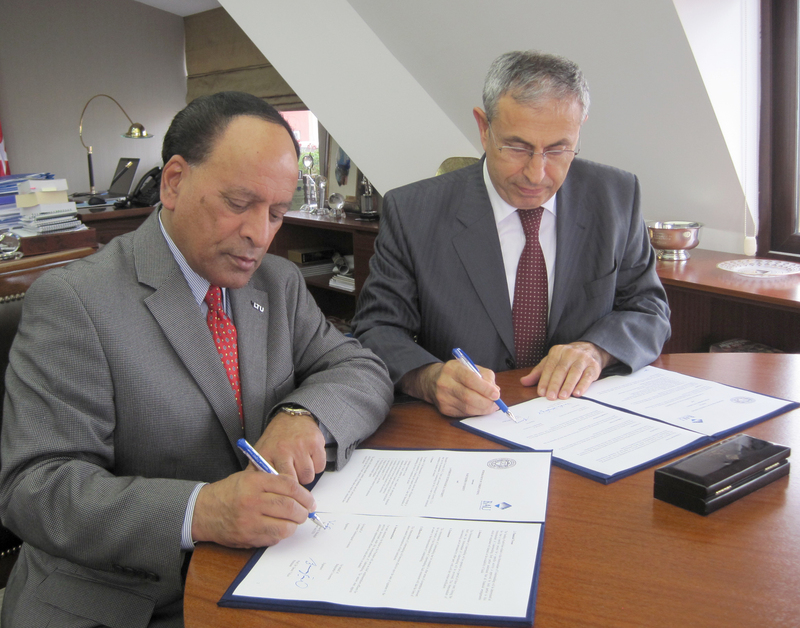 Lawrence Tech President Virinder Moudgil (left) and Bahcesehir University President Senay Yalcin sign a memorandum of understanding between their two universities on June 7 in Istanbul, Turkey. While visiting Turkey in early June as part of a Michigan delegation, LTU President Virinder Moudgil signed the agreement with Bahcesehir University President Senay Yalcin. Since its founding in 1998, Bahcesehir University has developed a reputation as one of Turkey’s leading private universities. It has ties with other American universities and a campus in Washington, DC. The types of cooperation authorized under the three-year agreement include student exchanges; faculty exchanges for study, research, and instruction; collaborative professional development; joint education programs allowing students from one institution to complete a degree by studying at the other institution; joint certificate programs and shared courses; and the arrangement of internships. “The parties will exchange students, teachers, and researchers and will perform educational activities on the basis of broad reciprocity in those areas in which both institutions have mutual interest,” the agreement states. Earlier this year, LTU signed new agreements with universities in Germany, China and Brazil and now has academic partnership agreements with more than 30 universities around the world.